Like the floor of some amazing carpenter’s workshop, the rivers and lakes beneath the Norther Cascades flow constant with the dust of its prominent peaks. The glaciers, as they creak and crawl, carve fine and seemingly infinite rock flower from their towering trails. The powder, once met with the reflections of sky and deep forest, glow brilliant aquamarine. The effect seems artificial. Beautiful landscapes inspire. The few moments where I have found myself in both amazing atmosphere and immersed in “teacher” thought have produced some of my most inspired lesson plans and project ideas. 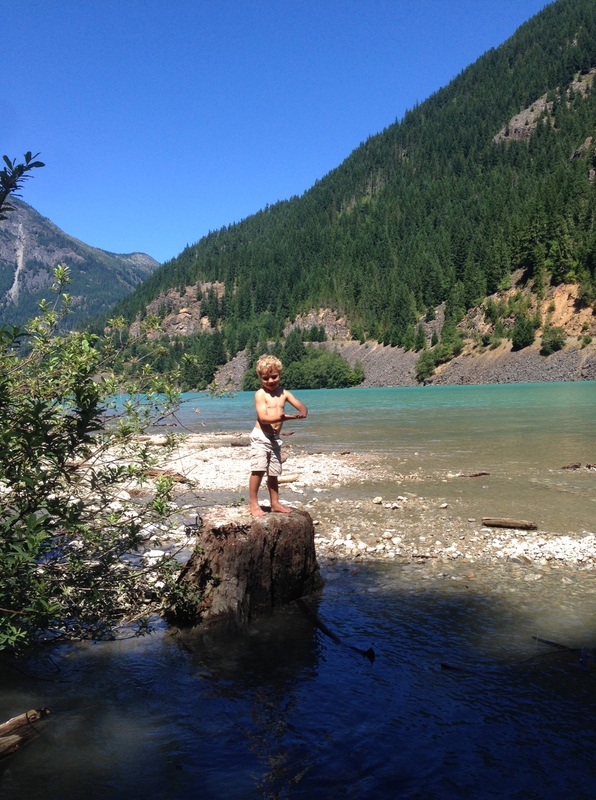 My son in full adventure at Ross Lake in Northern Cascades National Park. Every year feels like a new grade level. In some ways I feel like I am about to enter some absurd year of my own learning. The 28th grade, or some thing like it, is upon me and right now I am captured by its possibilities. For all the repetition that each Fall brings, this academic year has a different feel to it. I am teaching the same grade level (9th), the same subject (humanities) and in the same classroom, but my hopes for this year are more exciting and nerve-wracking than usual. I want my classroom to be better. I want my reading assignments to be more valuable. I want my writing assignments to be more interesting and inspiring. I want my projects to be more integrated and authentic. I want my conversations with students to be more positive and formative than ever before. In an attempt to push my practice I am trying a few things. 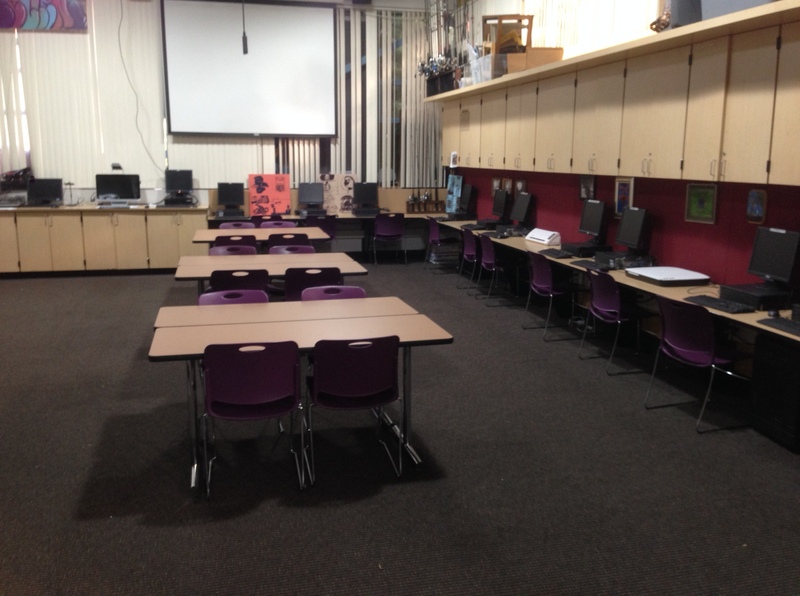 A new classroom layout that opens the room for me to move throughout the students and makes it easier for me to keep things clean and organized. 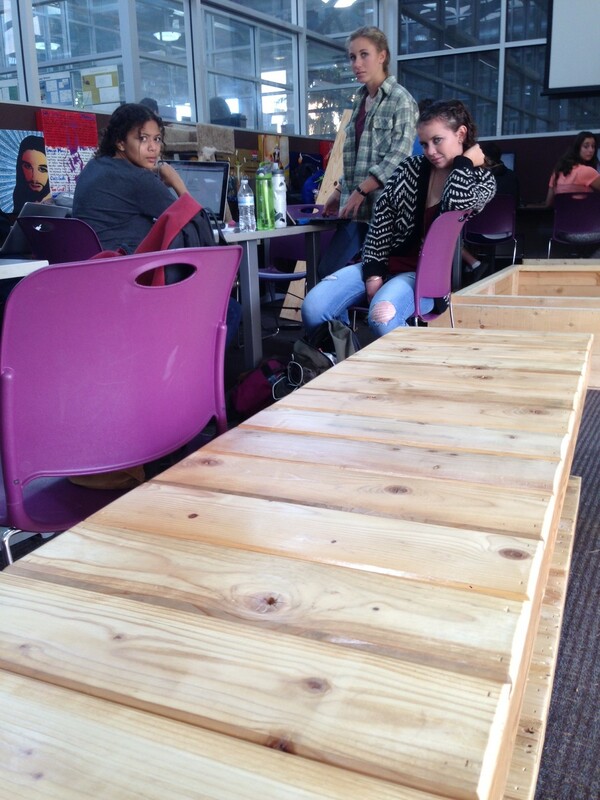 I hope that fewer tables will allow me to interact with my students more fluidly and will help to keep my floors and furniture more clean and organized. 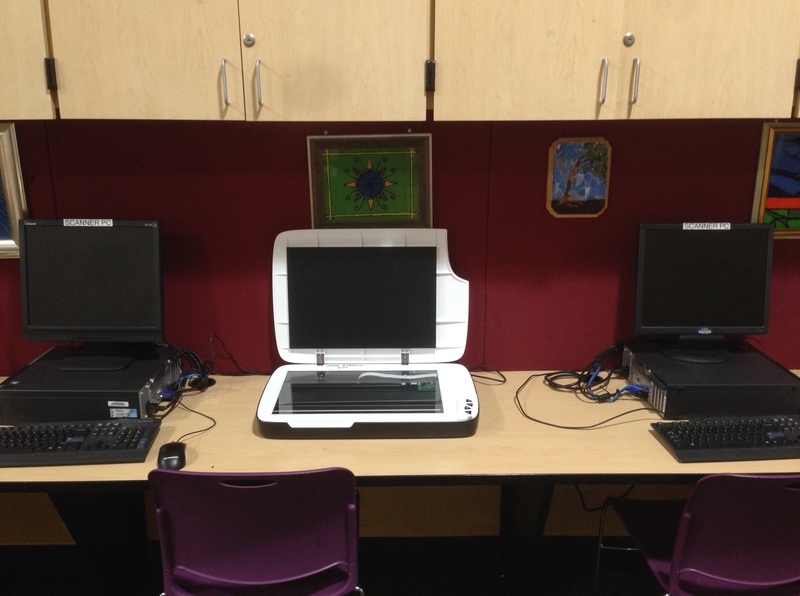 Project-specific workstations where students have access to tools that will be necessary/helpful to the project we are working on. Instead of the tools moving I am hoping to treat our graphic design, music and other tech tools much like tools in a machine shop are treated. The students will have time at each area when they need it. 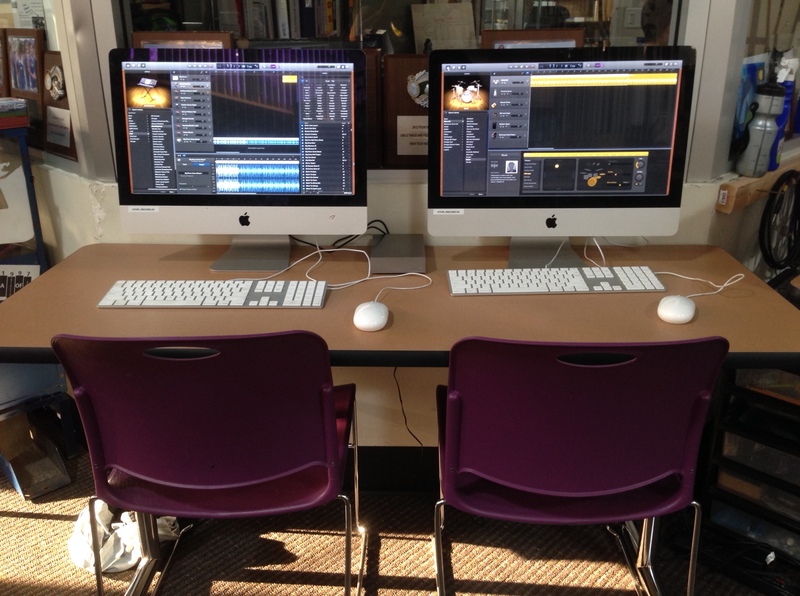 iMacs ready with Logic Pro X for multi-track recording and producing soundscape recordings from field trips in nature. 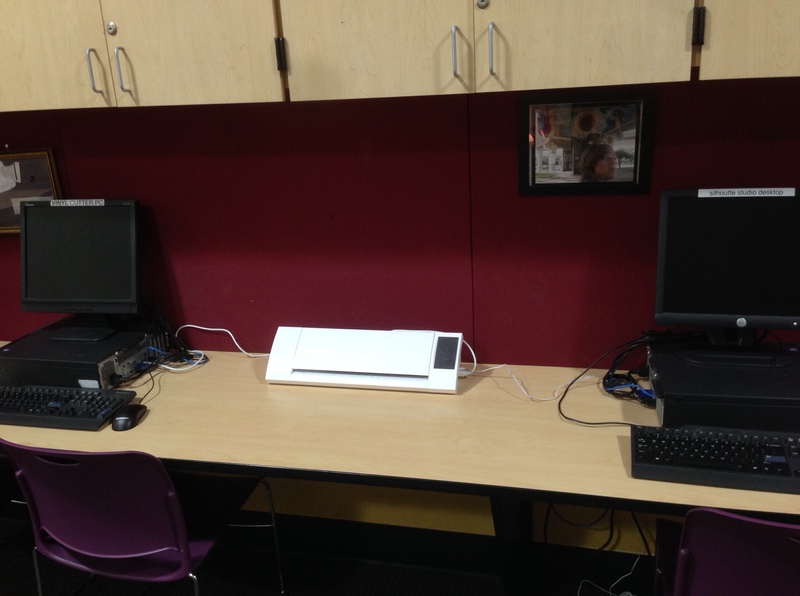 Large format scanner setup for scanning original artwork and designs for digital purposes including online portfolios, laser-cutting and digital revision. 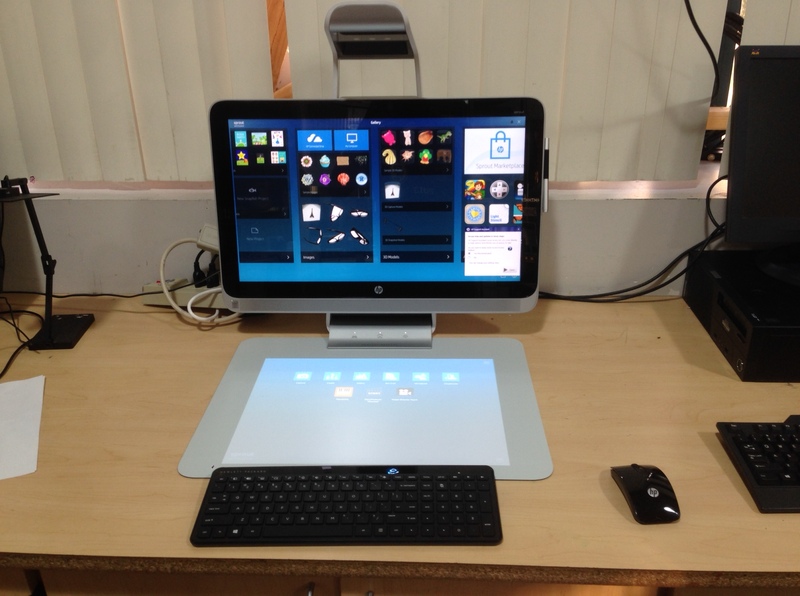 An HP Sprout setup to experiment with tablet tracing and 2D/3D modeling. A vinyl cutter with design software installed on two PCs for stencil cutting, precision marking of paper/thin sheeting, and other applications. Making stronger connections between my passions and my vocation. My thinking has been pushed by the experiences I’ve had over the summer, which I discuss in a few vignettes beginning with Vignettes from the Woods Pt. 1. I love that I work for an organization where my passions and pleasures and escapes are all fuel for what will happen in my professional life. I can’t wait to challenge students to live and explore and take in the beauty of the world with intentionality. Diversifying the reading required for my class to include more short stories and essays and fewer non-fiction articles or papers. I have been reading some amazing short writing that I’m anxious to share with my students (Muir, Asimov, Emerson etc.). I’m hoping that using shorter writing pieces and taking more time to work our way through them will help me identify struggling students and will allow me and our support staff to intervene before anyone falls too far behind. Multiple short pieces also make comparative activities between pieces more accessible. Tomorrow is the first day. Let’s go! Though each step seemed to demand a certain mustered discipline, we were ascending steeply and steadily. 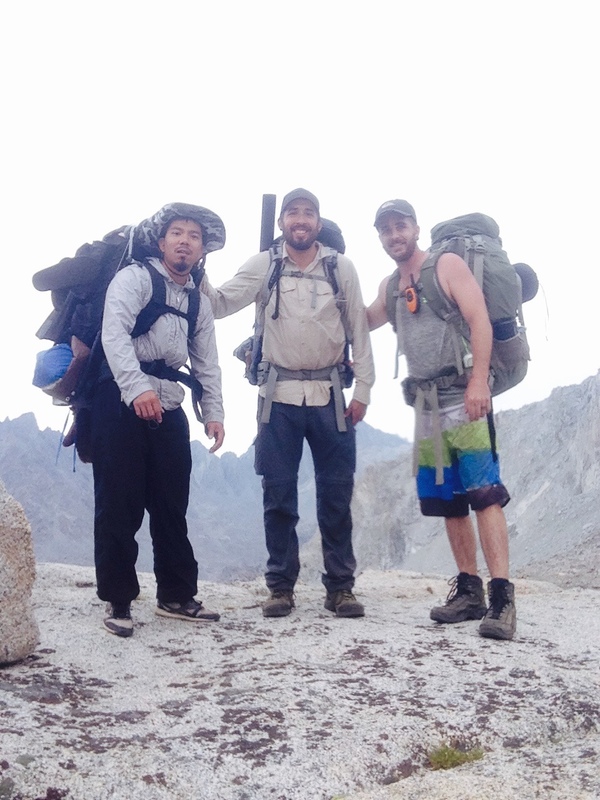 With full backpacks we scrambled three quarters of a mile up a boulder-lined waterfall, balanced our way 2 miles across mountain peak shoulders and came to the foot of our final ascent. The climb was incredible. Seven hundred feet of class 3+ ascent beginning at an elevation of 11,200ft. As we reached the crest our weary faces morphed at the sight of the new and beautiful basin below us. Our final ascent up Hurd Peak. 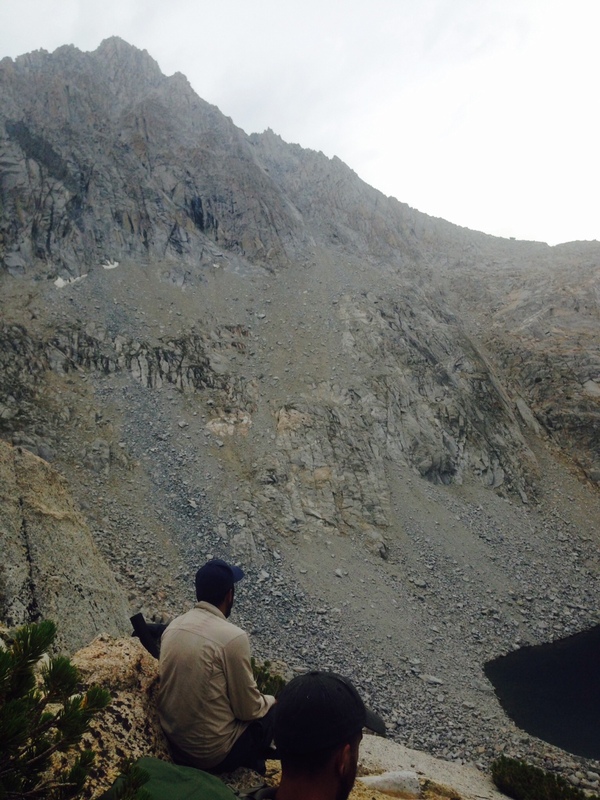 Notice the steep and unstable terrain…and ice! Exhausted, joyful and relieved at the top. 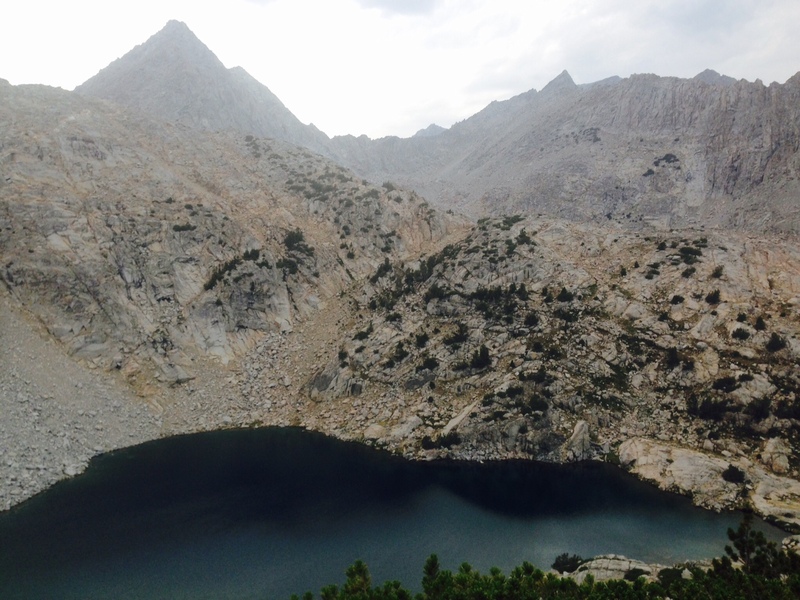 View of Treasure Lakes, where we began our final climb. 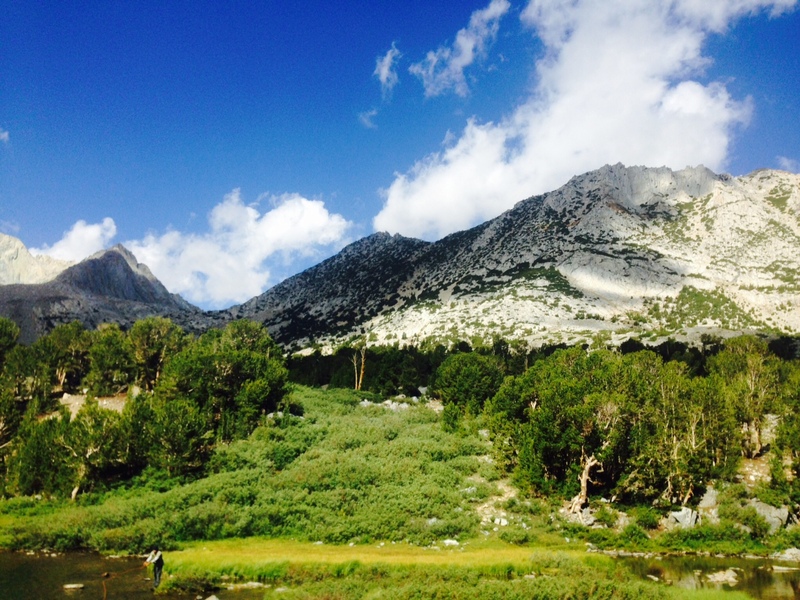 Bishop Pass Trail…the other side of the mountain. Only a day earlier we were at sea level, departing San Diego for a few days in the Sierras. Sometimes I need reminders like this. I need to be shown (not told) that amazing endeavor and adventure are always within reach. I can’t wait to share experiences like these with my new group of students. My hope is that they find value in doing “hard things”; that they accept challenges that will bring out the very best parts of their character and our human nature. I was a child of the 80’s and 90’s and, growing up in the digital revolution of Generation X, I was inevitably introduced to one of the world’s greatest entertainment innovations. Video games. I’m not writing to cast another generalizing shadow claiming that video games are wholly wrong. There are many games and platforms that might help develop some quality character traits like perseverance, critical thinking and collaboration. There are also some games that allow users to enter highly imaginative worlds where creativity and fantasy thrive. My thoughts here are focused on a specific thread of gaming evolution that seems to have become the pervasive genre. As my mom called them…killing games. Much has been said, written and about games like Call of Duty and Grand Theft Auto, but my thoughts and feelings about these games never really percolated until my students started work on our current project exploring the legality and ethics of domestic and military drones. The conversations we have had about privacy, constitutionality, policing and “remote killing” has been interesting if not disheartening. Many of my student are numbed to the destruction of a human life. I am sure that if they were faced with a “‘real-life” situation it would be different, but many of them were emotionless when talking about the taking of lives and projects like Not A Bug Splat or statistics about the collateral damage incurred during drone strike missions. I also noticed that I wasn’t as struck or repulsed as I would have hoped. I was a bit disappointed with myself and realized that I, too, may have fallen victim to the ethical novocaine that killing games can be. My history of video games dots an interesting thread from the relative innocence of 1980’s arcade games to the joystick-controlled drone warfare triggered by kids who grew up playing the same games I did. As a younger child I had an Atari 2600 gaming system. It was “high-tech” and amazing at the time, but now seems archaic and the football game I played (seen below) hardly seems to be the predecessor to Madden that it truly is. Eventually I received a Nintendo Entertainment System for Christmas. I became enthralled with the thing. Graphics were improved from the Atari, game variety was vastly increased and new accessories were available at major retailers all the time. I used the Power Glove, I shot about a million ducks on Duck Hunt and I earned amazing personals bests in California Games. I was a Nintendo kid. Mario and Luigi and King Koopa were awesome and entertaining, but eventually the culture of the games started to change. 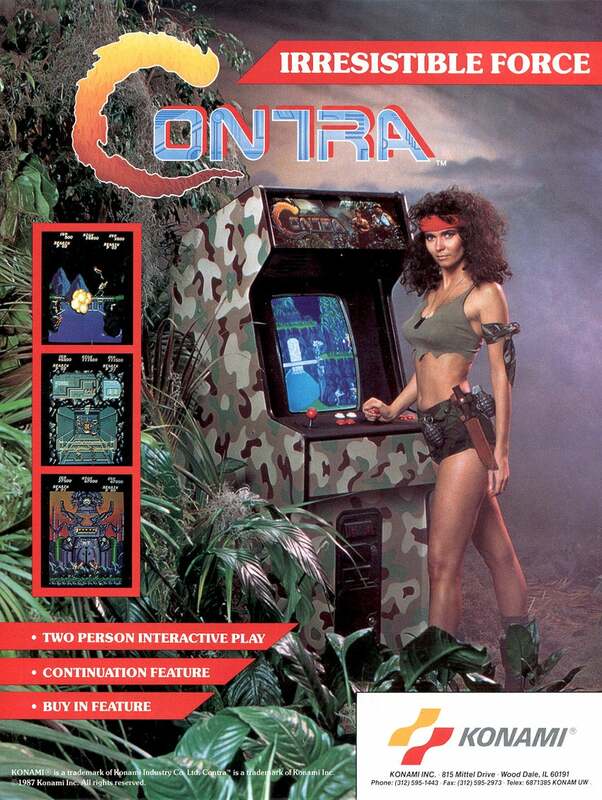 Eventually, I was part of a generation of boys who fell in love with Contra. It lured us with intense music, machine guns and ads like this: Away from home I was also being inundated by the weird allure of arcade games that offered a similar thrill. My favorite at the time was Final Fight which, as it’s own Wikipedia page describes, “is a side-scrolling beat-’em-up produced by Capcom.” I used to spend hours at the video rental store in my hometown pushing quarters into this machine: The 80’s also pushed a new gaming platform into our homes. The personal computer was great for educational games like The Oregon Trail and Number Munchers, but really captured the adrenaline of youth when Wolfenstein 3D came on the scene. As the grandfather to all First-Person Shooters, Wolfenstein 3D enamored users with Nazi enemies, big guns, secret passages and a three dimensional playing platform. Throughout the 90’s the gaming industry found a major market pushing the boundaries of video violence through increasingly realistic graphics, advancements in computing speed and internet playing options. Nintendo, Sega and other companies found themselves in a sort of gaming arms race. The Super Nintendo was met by the Sega Genesis. The Nintendo 64 was answered by the Sega Dreamcast. Sony broke onto the scene in 1994 with The Playstation, which vaulted gaming into the disc-based world that we are just now departing from. All the while the popularized games were affecting us. 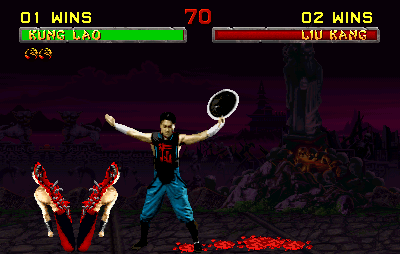 Mortal Kombat made violent deaths attractive by offering bonus points for extremely graphic “fatalities”. Street Fighter was one of the most popular arcade and home system games of the 90’s. 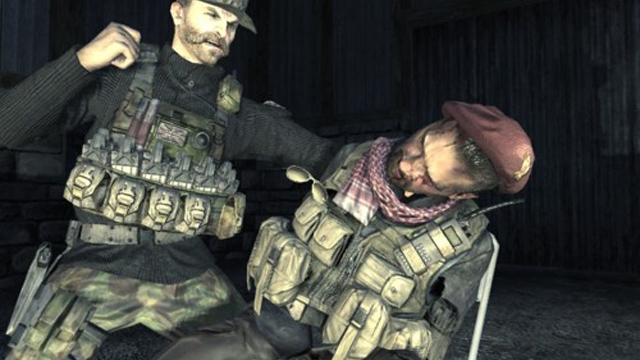 A torture scene from Call of Duty 4: Modern Warfare. A scene from “No Russian” a mission on Call of Duty: Modern Warfare 2. The user’s mission is to kill all civilians and police officers then escape the scene. These games have made us increasingly comfortable with hitting, fighting, shooting, and even killing. Children around the world received the validation of bonus points and other extras for intensely violent deaths or beating their opponents with vicious combinations of kicks, hits and strikes from weapons. Over time a generation of gamers has inevitably become conditioned. In some ways the controller and the screen have become a portal that buffers our ethics, our disgust and our empathy toward other human beings. We aren’t as affected by killing or getting killed as we used to be and now “real war” and “virtual war” are converging. 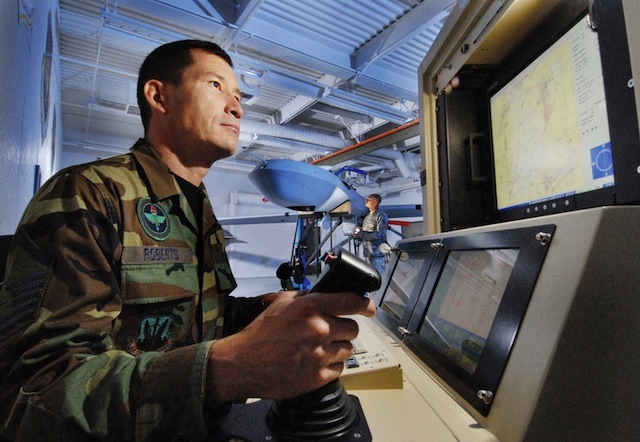 An MQ-1 Predator Drone instructor with the California Air National Guard remotely controls his drone. 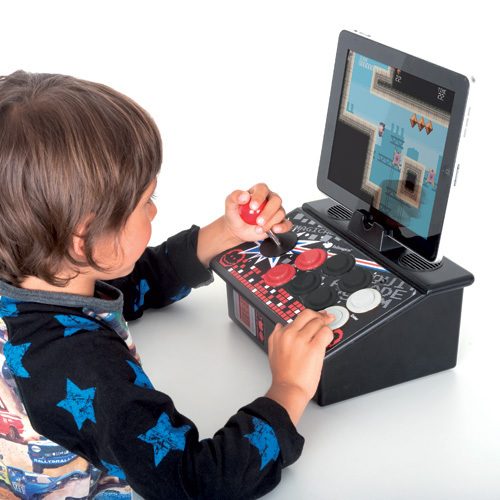 A young boy using a joystick-controlled video game console. During my first few years teaching one of my mentors instilled a mantra in me. We all go through life and school and careers seeking some sort of validation for our time and our effort. I see it in students everyday. Teenagers who are caught between childhood and adult life try to get attention by choosing styles, latching on to a genre of music or working their way into a certain crowd or clique. Sometimes it is beautiful to see them find community and friendship. Sometimes I cringe at the trajectories they choose and the way they present themselves on their Twitter feed. I like to think of our school as a place where anyone and everyone can be noticed and valued. 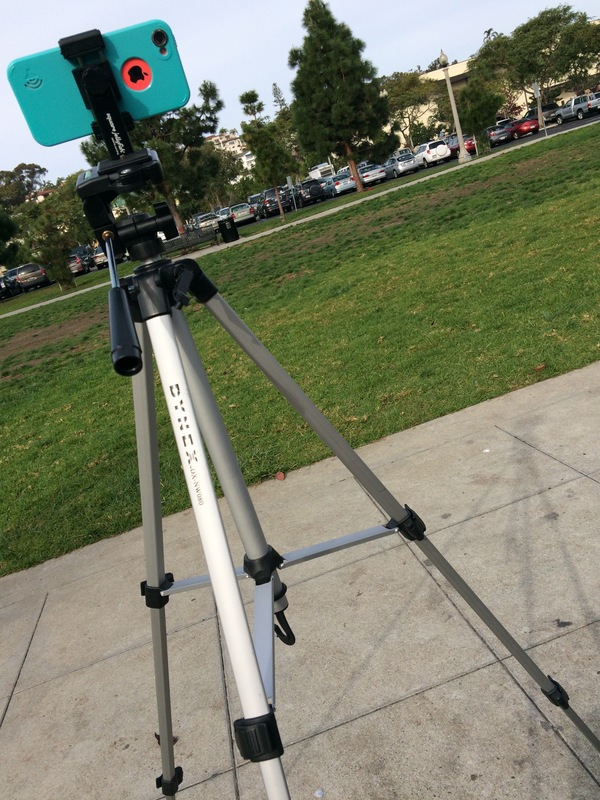 If you are a wandering student, you will find a place. If you are a wandering teacher, you have a chance to find your practice. 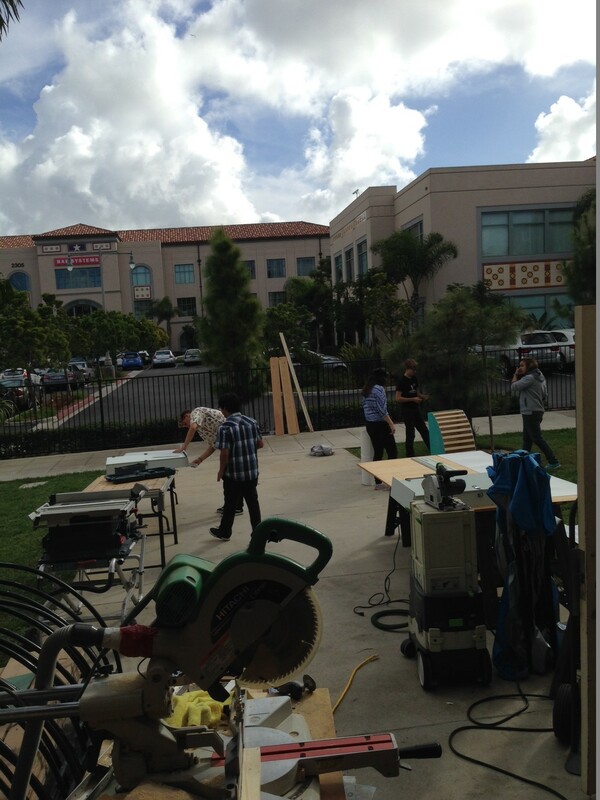 At High Tech High, projects, presentations and exhibitions are both tools for assessment and avenues for sharing and valuing time and effort. I walked a lap around campus yesterday with the specific goal of “noticing”. 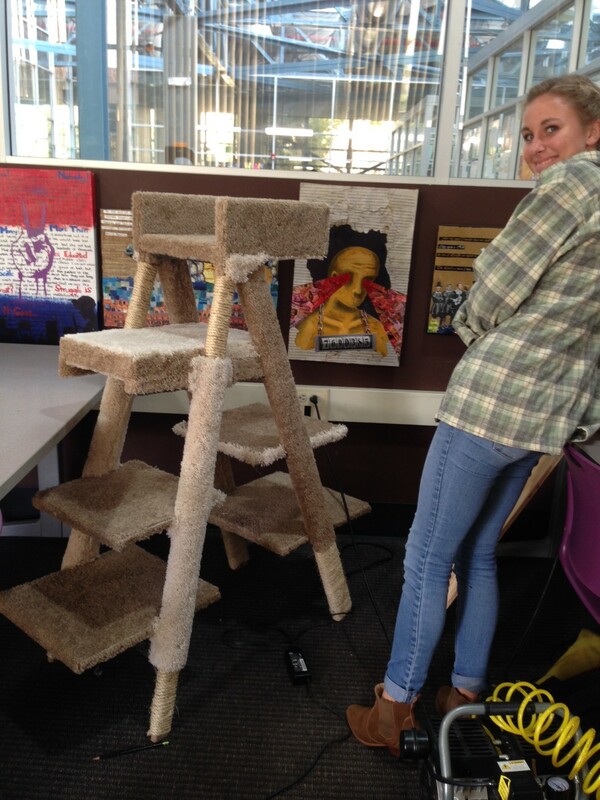 Students turn a junkyard broken ladder into a cat tree for an animal rescue organization. 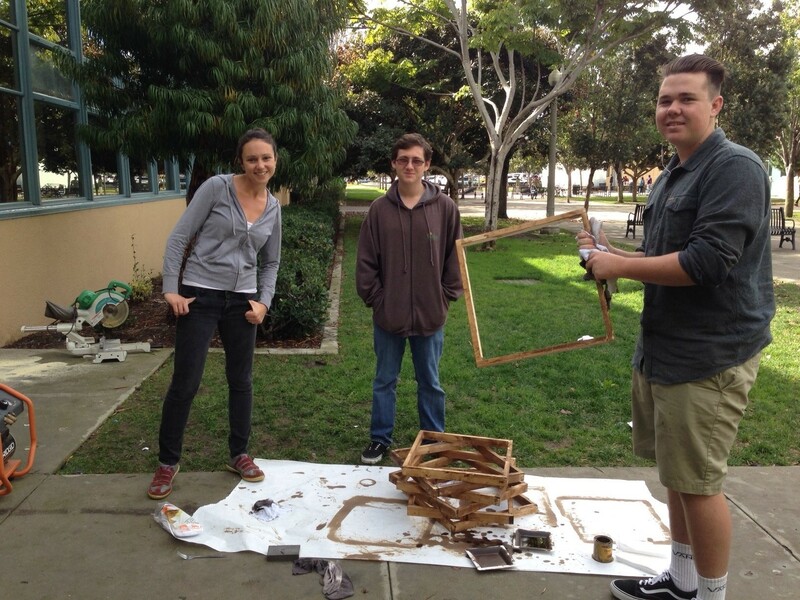 Sarah and her 10th grade students construct frames for displaying her “Shadow Boxing Quadratics” math project. 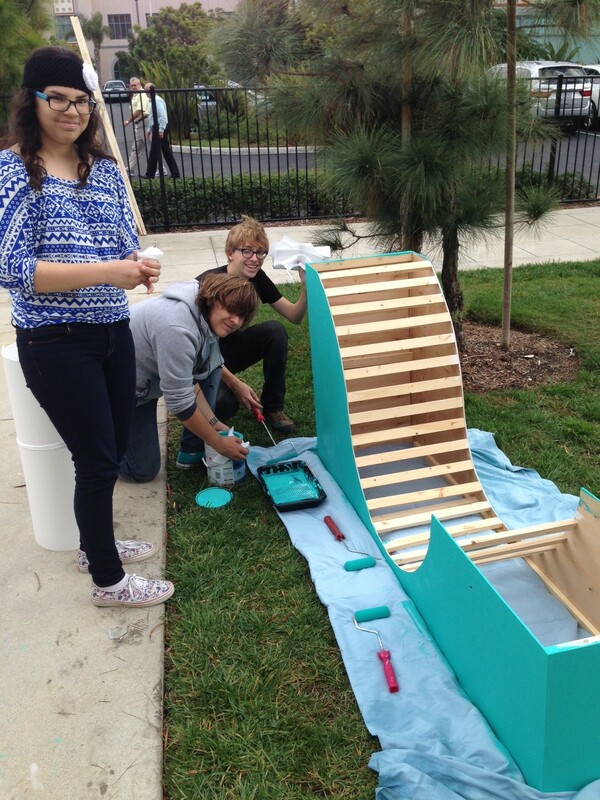 11th grade students build furniture out of junkyard material for non-profit organizations. 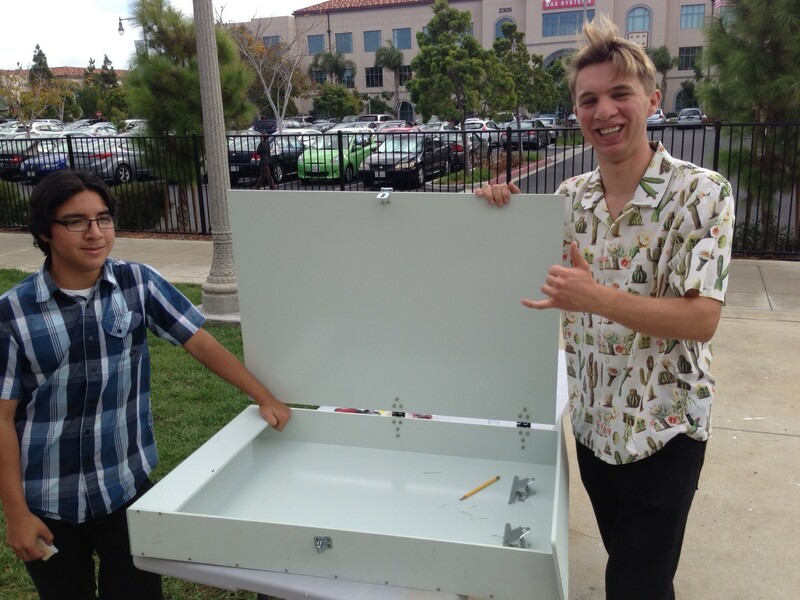 11th graders pose with an art and storage easel they made out of junkyard filing cabinets. It’s exciting to see great work and even more satisfying to find alumni from my 9th grade class thinking and making with care and intent. They are shining. I think others will be hard pressed not to “notice”. 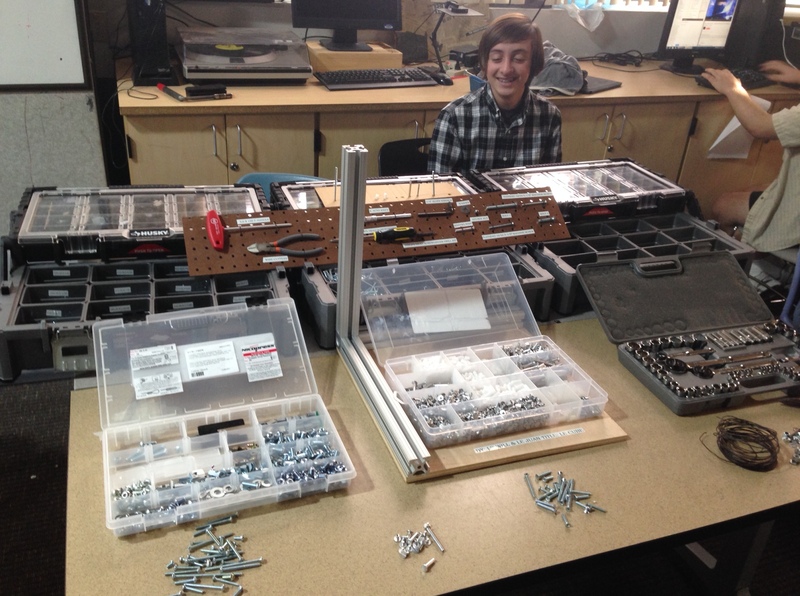 Often project-based learning lives or dies by the success of the products that students design and create. This “proof is in the pudding” model of assessment is fine for engaging students in rigorous culture of “getting it done”, but too often we lose sight of the importance of showing the learning process. Exhibitions should include examples of the project journey. Final products should be accompanied by drafts, critiques and models. Students shine when their audience realizes the complexity and enormity of what has been synthesized in the product(s) they create. I have loved walking the halls and observing students using new tools, working with new mediums and integrating multiple content areas. Learning is happening. Credit goes out to the teachers who are trying new things, building something crazy, designing politely subversive curriculum and pressing-on in progressive education. 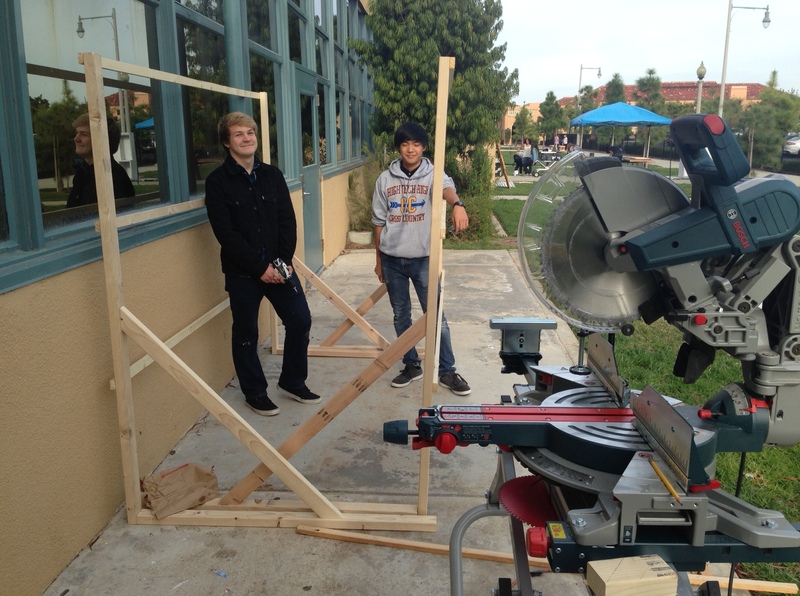 Students building frames for displaying their math projects. 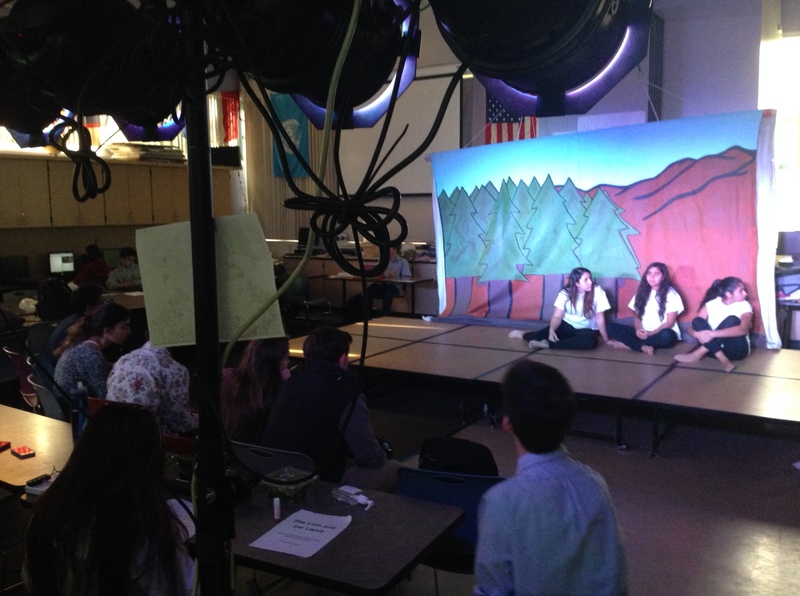 Students running stage lights and rehearsing Greek plays. 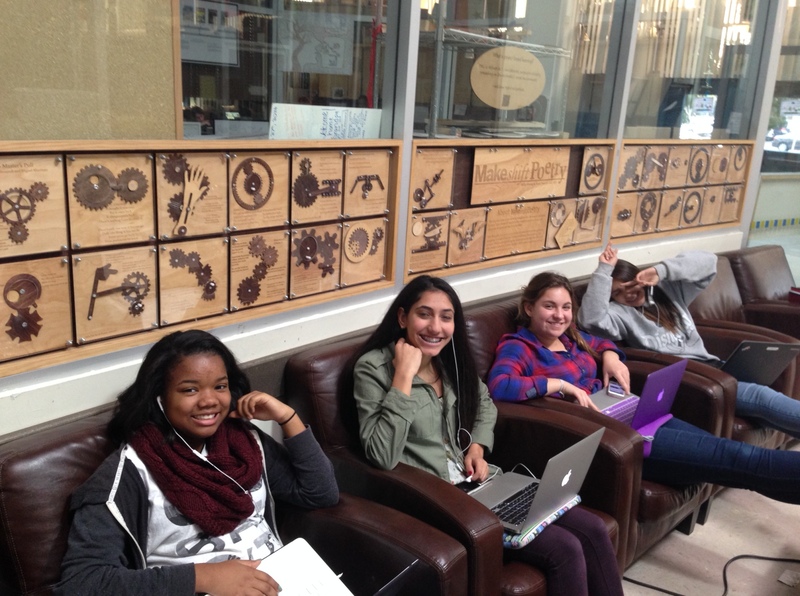 Students editing research papers and displaying mechanical poetry art pieces. I am making a push to improve my digital portfolio usability and aesthetic. 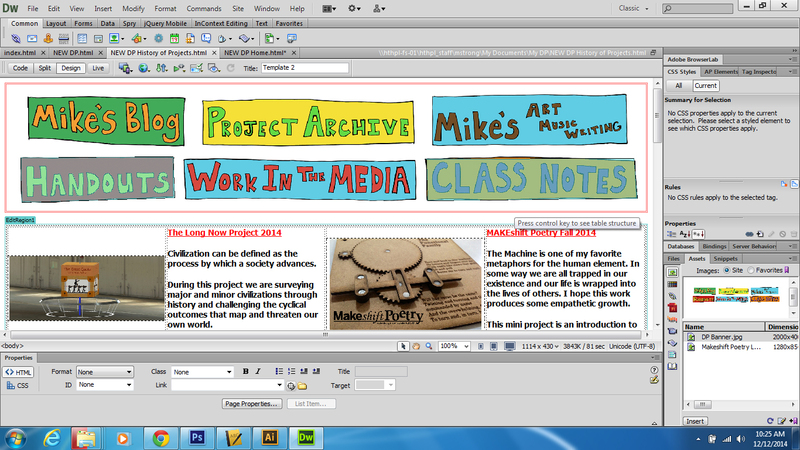 Much of my new design has been done between Photoshop, Illustrator and Dreamweaver using hand-drawn images and scanning. This is the first phase of my re-design. 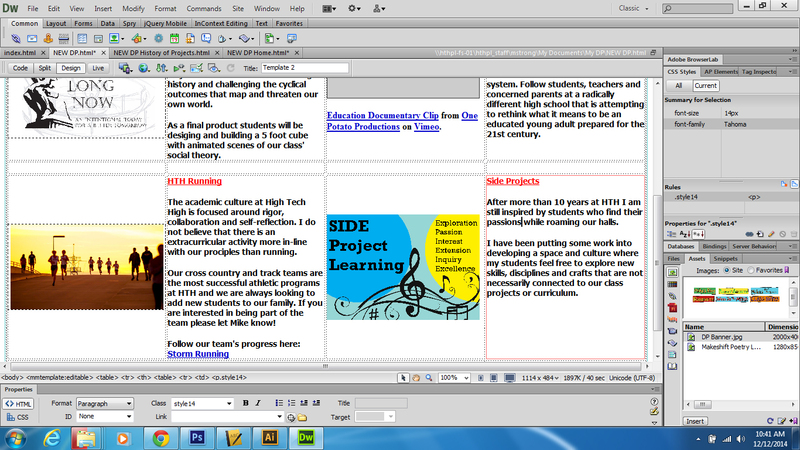 I look forward to posting more examples of the process as my students critique the site and I make changes.